In this workshop we delve into the actual, step-by-step (hands-on) management of change in families with adult children. This workshop emphasizes practical change management skills. Participants are encouraged to bring actual ongoing cases as illustrations. Live interviews with families are also welcome. 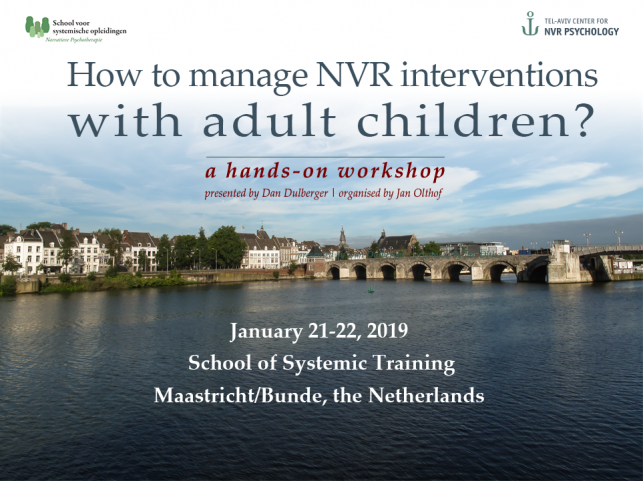 The course assumes some general knowledge about the NVR approach, as well as about emerging adulthood, Adult Entitled Dependence and the Adult Children phenomenon. It is recommended that you at least read our paper. The course will take place, in English, at the School voor systemische opleidingen in Bunde/Maastricht, Holland, on January 21-22, 2019. The training fee will be 290 € including lunch, coffee and tea. Information on available hotels ,B&B and lodging, will be provided to those interested. Please fill in you details to receive more details about the trainings.